Thursday 16th April was a special day in Stroud. 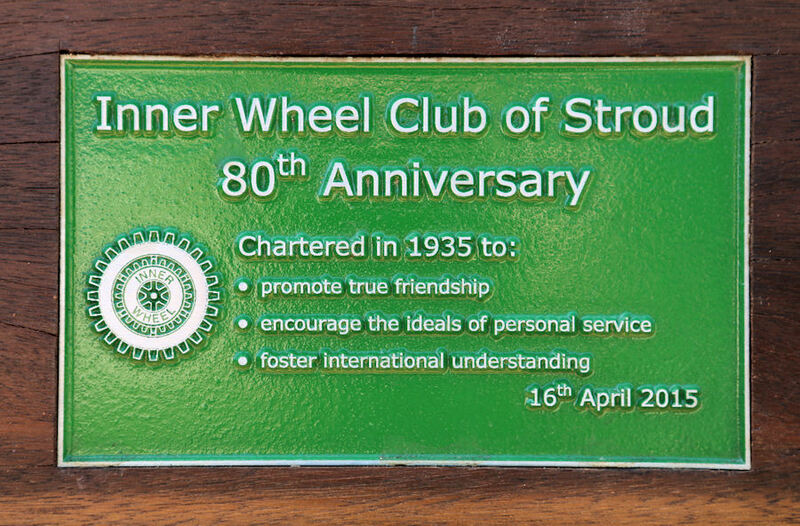 The date marked the 80th anniversary of the Inner Wheel Club Stroud. Katie Fforde, the Stroud based best-selling author of contemporary romances, unveiled a canal side commemorative bench to the west of Stroud Brewery Bridge, Wallbridge. The event was organised by current Inner Wheel President Carol Bowen who addressed a sizeable group of local people with an interesting history of Inner Wheel. Carol explained that the organisation was formed in 1924 by the wives of Rotary Club members in Manchester. 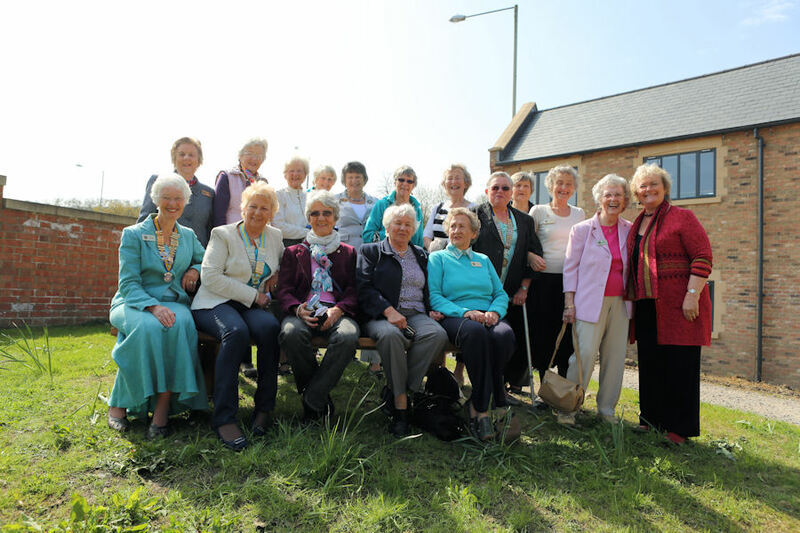 Just eleven years later Stroud’s Rotarian wives formed their own club which received its charter on 16th April 1935.
International Inner Wheel is now one of the world’s largest women’s voluntary service organisations. Carol explained that each year the Inner Wheel Club President chooses a charity to support. The Cotswold Canals Trust (CCT) was Carol’s chosen charity for her year. This led to IWCS raising funds for the restoration of the canal. The funds achieved were used for the hardwood bench with its commemorative plaque. Carol congratulated CCT Vice Chairman Jim White on his inspired idea of creating commemorative benches to raise funds for, and awareness of, the restoration. She also thanked David Marshall, Stroud District Council's Canal Restoration Project Manager, for permission to site the bench at Wallbridge. 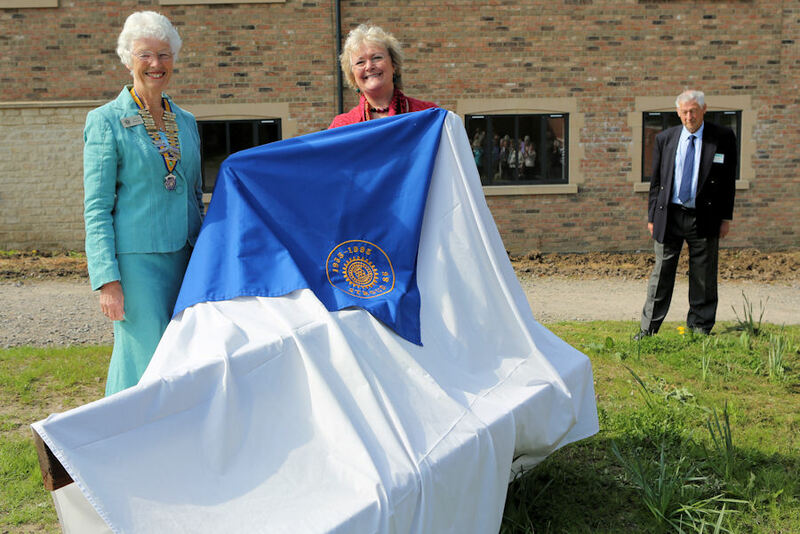 Katie Fforde then performed the unveiling by revealing the bench previously concealed beneath the Inner Wheel cloth. Katie also explained her enthusiasm for inland waterways which led to operating a pair of hotel boats with husband Des touring the canals of England. CCT Vice Chairman Jim White was invited to describe the provenance of this bench, and over forty other commemorative and corporate benches produced and installed by the CCT’s own volunteer force. Jim explained that the benches are built using a recycled water resistant hardwood known as Greenheart. The timber is reclaimed from shipping wharves undergoing refurbishment around UK coastal installations. Jim went on to thank Carol Bowen and her team for their support of canal restoration through Stroud. The group then adjourned for refreshments at the Cotswold Canals Trust Visitor Centre beside Wallbridge Upper Lock.